Grain elevators are houses for grain, inhabited by humans only when grain is being transferred from or to the elevator. At the top of the grain elevator is the headhouse, recognizable from the exterior by the gable roof and windows. The headhouse is accessed using a single-occupant dumbwaiter which travels parallel with the grain elevator leg, and is either manually or electrically operated using a pulley and counterweight system. (See Footnote 2) Within the headhouse, grain that has traveled vertically along the elevator leg is transferred using a moveable spout into numerous bins. In order to prevent uneven settlement of the grain elevator building, grain must be evenly distributed to each of the bins. (See Footnote 3) When the time comes to transfer the grain, a spout at the bottom of the bin is opened to allow the grain to flow into a hopper, from whence it is transferred into waiting train cars or trucks by an auger conveyor. The form, proportions, and materiality of the timber grain elevator are directly informed by its singular purpose and fundamental construction technique. Bins are oriented vertically to utilize gravity for the transfer of grain. The dimensions of the individual bins are determined by the structural properties of the wood, and the manner in which the bins are organized determines the width and depth of the building. The vertical orientation of the bins, and the necessity that the headhouse be placed above the height of the bins, determines the height of the building. 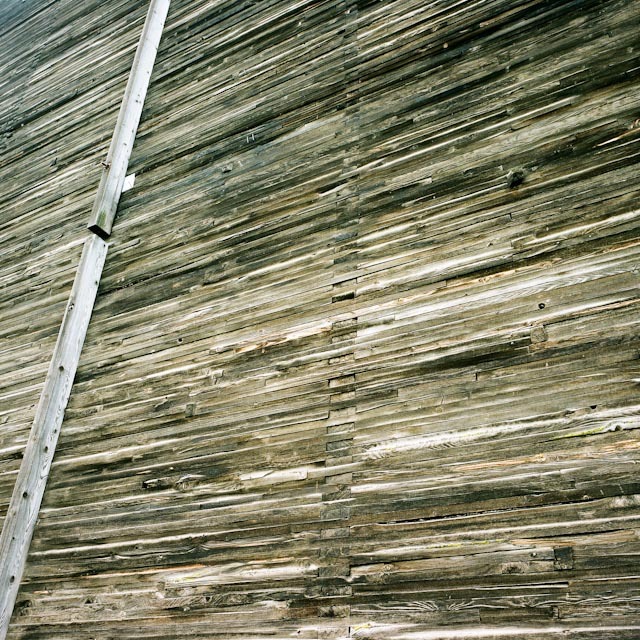 To prolong the life of the building against weather, the exterior timber walls are typically covered in metal siding. The cribbed construction is exposed when the metal siding is not maintained and subsequently peels away from the façade. The corners of the building are revealed as dovetailed joints; the section of the building is revealed in the façade where the intermediate bin walls intersect with the exterior wall. 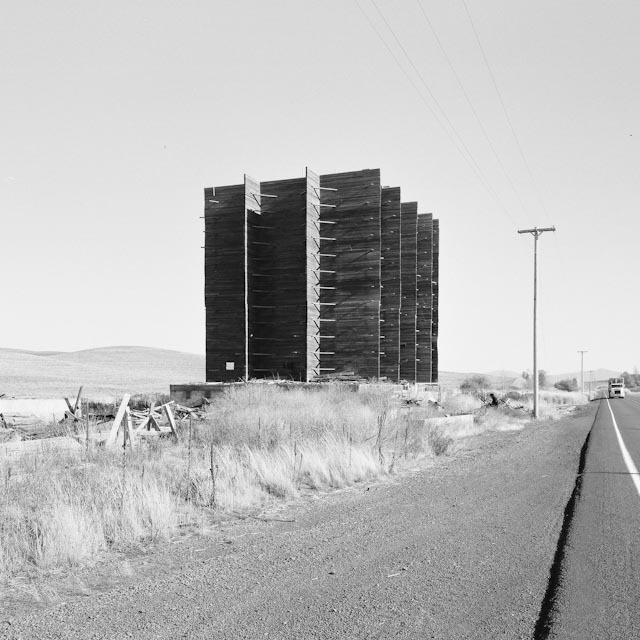 In Fall of 2008, Robert Hutchison and Taiji Miyasaka taught a graduate design studio at Washington State University which argued for the reuse and integration of three timber grain elevators within the Pullman region, to serve as civic and research sites for the benefit of the city of Pullman and the Washington State University. (See Footnote 7) As part of this studio, the grain elevators were documented using photographs and measured drawings, some of which are contained within this article. Timber grain elevators first emerged on the Palouse landscape at the end of the 19th century as settlers began to develop the Pullman region, attracted by the fertile land for agricultural use. While originally served by the railroad, today’s farming practices increasingly rely on trucks to transfer grain from the harvest fields directly to shipping barges at the port of Lewiston on the Snake River. (See Footnote 8) This agricultural development, combined with the ability for concrete and steel elevators to hold larger quantities of grain, their being less susceptible to fire compared to their timber counterparts, and the high material and labor cost required to construct timber grain elevators, has meant that few new timber grain elevators have been constructed since the 1950’s. Despite the pitfalls associated with timber grain elevators, some farmers find advantages in them. Mark Whitmore, a farmer who owns a timber grain elevator located in downtown Pullman, continues to use his timber grain elevator to store grain. “The wood walls of the elevator are advantageous compared to the steel and concrete counterparts, because they actually absorb moisture from the grain. This allows me to use the building to dry the grain before it goes to market”. Also, multiple bins situated within one structure provide the ability to store multiple types of grains for varying lengths of time, allowing Whitmore the economic advantage to await favorable market fluctuations. Finally, the multiple bins allow him to “clean” the grain, a process where grain is moved from one bin to another through a sieve to remove impurities (such as particles of weeds from the harvest). Yet farmers such as Mark Whitmore represent a minority. Insurance companies are resistant to provide insurance because of the higher fire hazard associated with timber grain elevators, and farmers note that more labor is required to clean the multiple bins. And while historically the labor required to carefully disassemble the structure has not outweighed the value of the material itself, this appears to be changing due to current economic conditions. (See Footnote 9) Due to a developing market for the salvage and reuse of quality timber, individuals and companies have emerged who specialize in dismantling crib elevators. Jeff Williams, owner of the Lazy J Lumber Co based in Genesee, Idaho, is currently dismantling several grain elevators in the Palouse. Williams stated that lumber from wooden cribs is often of very high quality, since the wood was harvested from virgin forests. Williams “reclaims” the lumber to sell to mills, who reshape it into flooring, trim, wall coverings, and for any other purpose where good, high quality grained wood is desired. The time required to dismantle an elevator is typically one to two months, depending on its size. Until recently, these sentinels of the Palouse landscape have remained in limbo, stripped of their original function and difficult to adapt to new purposes, yet resistant to the detrimental effects of time and weathering, and embodied with opportune material value. 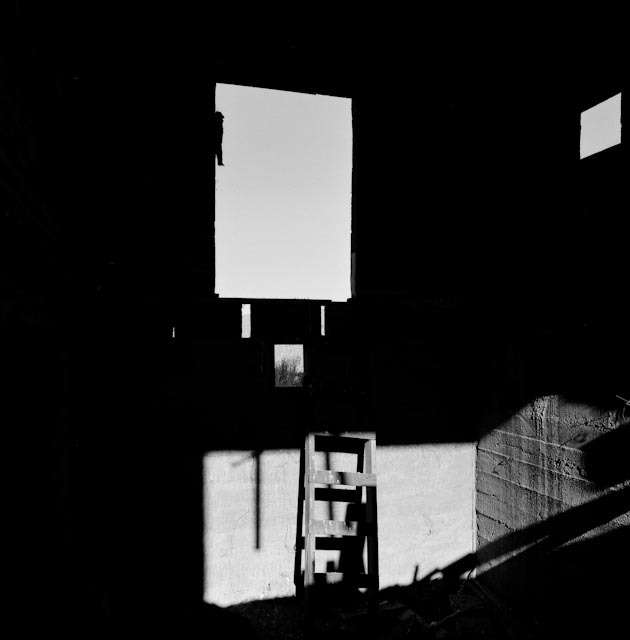 With their original function removed, as they stand derelict awaiting pending demolition, these buildings which were formerly filled with grain and darkness begin to acquire the architectural qualities of space and light. 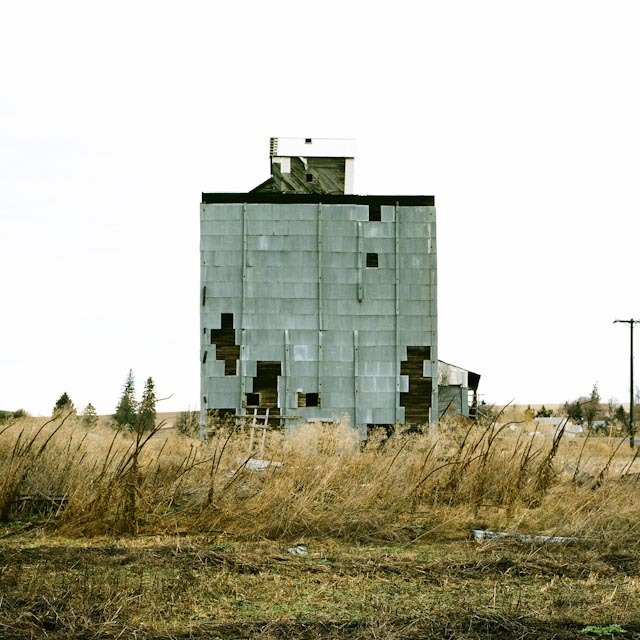 Yet ultimately, it is their material value which will result in the disappearance of the timber grain elevator from the rural landscape. A Dictionary of Architecture and Building, by Russell Sturgis, 1905, p. 288. - The Design of Walls, Bins and Grain, by Milo Smith Ketchum, 1907, p 225. The grain elevator located in downtown Pullman, WA, owned by the farmer Mark Whitmore, has 15 bins, with a total building storage capacity of 50,000 bushels of grain. Whitmore often harvests a winter wheat called Madison wheat which is used for the production of beer. “Within the context of agriculture, bushel is defined as: A dry volume measure of varying weight for grain, fruit, etc., equal to four pecks or eight gallons (2150.42 cubic inches). A bushel of wheat, soybeans, and white potatoes each weighs 60 pounds.” (www.hobbyfarmlife.com/dictionary_agriculture_terms/bushel.html). Thus, fully loaded Mark Whitmore’s grain elevator can store approximately (60 pounds x 50,000 bushels) = 3 million pounds, or 1,500 tons, the equivalent weight of approximately 1,000 automobiles. Mark Whitmore noted that while sloped bins are easier to empty, the flat bins afford for more storage of grain. The studio project intentionally focused on Washington State University, originally founded in the 1890’s as the state’s land-grant institution (the Washington Agricultural College and School of Science). Agriculture as a research topic continues to be of primary importance to the University. The studio program proposed that WSU was implementing a new environmental program to provide off-campus research stations that would serve as “meeting places” between research scientists and the general public. Initial funding would permit for the construction of an Orientation Center and two satellite Research Stations, while future planning would anticipate the creation of a network of at least ten additional satellite stations. The program noted that the University was requesting that sites with a history of agricultural use be given priority consideration. 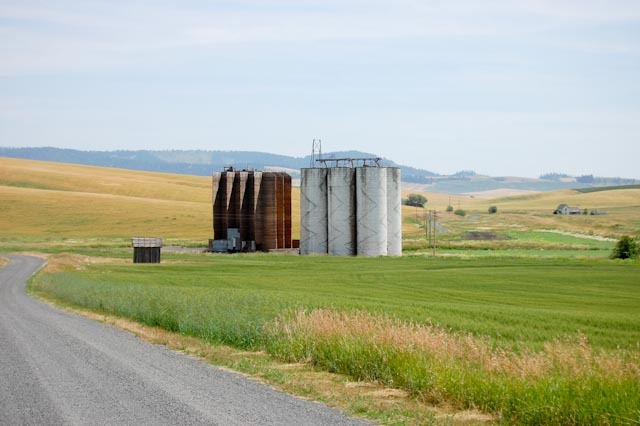 Accordingly, three grain elevator sites located in and around Pullman were selected to serve as the sites for these research stations. The program noted that the University required that the grain elevators be integrated with new construction to accommodate their programmatic requirements. Mark Whitmore noted that railway service for the transportation of grain in and out of Pullman was terminated in 1994, due to the railway company continuing to raise prices. Farmers realized that transporting grain by trucks was cheaper even though trains can carry significantly more grain. Demolishing these buildings is no easy task if the intention is to salvage the lumber for future sale or use. 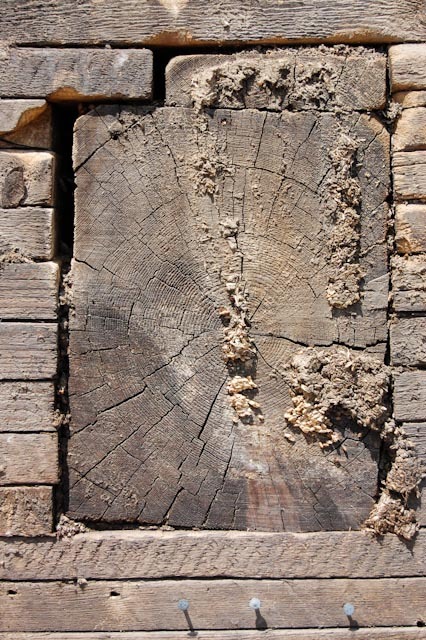 The cribbed construction technique utilizes long metal nails at regular intervals to spike multiple layers of lumber together. 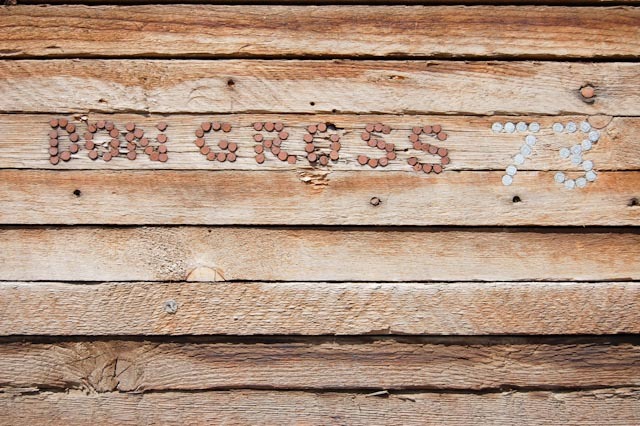 Mark Whitmore stated that 60 penny nails (2 gauge x 6” long) were used in the construction of his grain elevators. 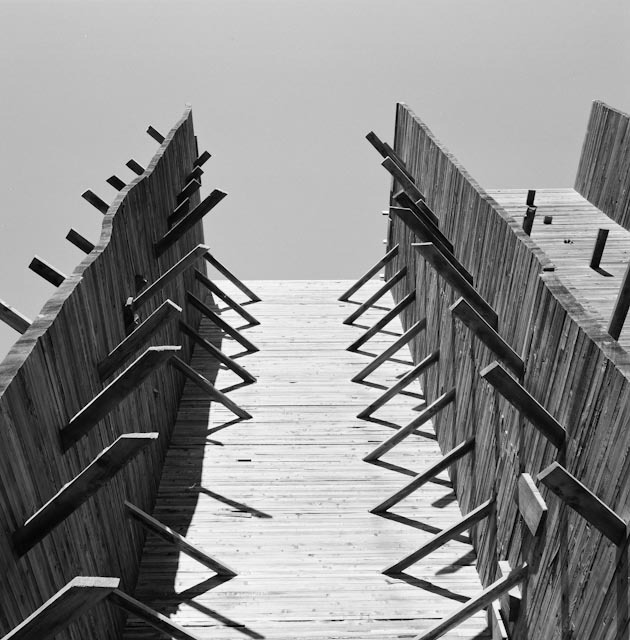 This would allow four full courses of 2x lumber to be spiked together with one nail.